Doors are more than just simple access. They are important parts of building designs, providing visual and technical benefits. All types of doors offer specific pros and cons, due to differences in their materials, designs, and working operations. Whether you are a designer, architect, or homeowner, knowing the characteristics of different doors will help designing a building or buying a dream property. Here are common door types you need to know. Various door designs have unique working operations, from the simplest to the most complicated mechanisms. Here are some common examples. Sliding door is attached to its place by putting them on two “tracks”, with rails and runners to support the door’s movements. Sliding door is often associated with Japanese-style homes, but it is now a popular option in urban homes due to its ability to save space. Traditional-type sliding door opens and closes by being pushed manually. However, you can see its modern version at offices or malls, where the door panels are equipped with sensors for automatic open-and-close movements. Costs: USD300 for a 6-feet sliding door with basic design and simple frame. A larger door (around 8 feet) may cost around USD700 to USD1,000. Costs may exclude installation. Folded doors consist of several panels that open and close by folding mechanisms on the hinges. When the doors are opened, the panels will join into a tight bundle. Closed, the panels form a flat surface. The folding mechanisms are created by attaching the top of the creases between panels to top and bottom hangers. The hangers will move on the tracks, folding and unfolding the panels whenever you need them. Doors that have more than two panels are often called “accordion doors” due to the shape. Costs: A simple folding door with two panels may cost around USD160 per panel. Glass panel doors that extend from ceiling to floor cost around USD1,000 per square foot. Hinged doors are the most common types to find around the world. These doors range from a simple wooden plank, to thick metal and elaborate artwork-filled panel. A hinged door is attached by vertical hinges that pivot the door back and forth. The simplicity of hinged doors makes them easy to design, modify, and combine with other interior design aspects. They are also easy to install, and people with moderate level of construction skill can make them easily. Costs: A simple hinged door can be installed cheaply with cost between USD50 and USD80 per door. Prices increase based on sizes, materials, numbers of doors, and designs. Rolling shutters are curtain-like doors with rows of metal slabs (slates), and you operate them by dragging and lifting them. The slates show coiled and uncoiled movements when the door is operated. In opened condition, the slates are stuck on a metal slab on top of the frames. The side parts of the building have railing systems that guide the door when opened and closed. Since the doors are usually made of metals such as steel, they are usually installed on storage spaces or garages. Costs: Basic rolling shutters may cost between USD350 and USD550. Prices may be higher if the shutters use more sophisticated technology. Battened & ledged door usually consists of wood panels, which are enforced with horizontal (battened) and vertical (ledged) planks nailed on the exterior. These doors are built for protection, with thick and sturdy structure. The basic construction itself may just be simple hinges. Battened & ledged doors are common at buildings such as barns and farm storage homes. This door type is strong enough to handle bumps and strong wind, although cold drafts or heat can still enter through the creaks. This door is also often installed to give vintage look in a modern house or establishment. Collapsible doors consist of thick, shutter-style panel and lightweight metal frames. The doors are designed to provide protection while enabling secure communication. They are very common at stores, warehouses, and other places where security, circulation, and direct communication are vital. The simpler versions of these doors are often seen at houses. They are usually installed to secure windows , terraces, side access, and patios. Costs: Collapsible doors are custom-made, so costs can vary, but they may start from USD530 per linear foot. Swing doors have similar hinge mechanism with common doors, but they can open to both directions. Also known as “restaurant doors”, swing door panels move to both sides. The doors can be opened with just a slight touch, unlike common hinged doors that require knobs. Some swing doors have full sizes, while others only provide partial covers. The doors are often built at restaurants, bars, coffee shops, and even home kitchens. People can bring foods or other things with both hands and still be able to open the doors. Costs: Simple model with half size may cost as little as USD50. Larger doors with extra decorations or sturdier materials may cost between USD70 and USD100 per panel. A staple in public buildings, revolving doors consist of a rotating shaft and four “wings” or glass panels. The bottom part has ball bearings to reduce noises. A person who goes through the door can anticipate the other person coming, making access smoother and easier. Costs: Revolving doors installation may cost between USD20,000 and USD50,000, depending on the sizes, styles, and standard prices in the area. Framed and paneled doors are basically modified hinged doors. Panels add visual touch without being loud, but there are other modifications for this style. For example, some people add glass panels to improve visibility and light, while others add louvers or wire gauges for extra circulation and privacy. Costs: Paneled doors with sophisticated woodworks and solid materials may cost around USD1,000 to USD3,000. Doors from cheaper wood with simpler design can cost less. Flushed doors are simple hinged doors made of softwood, with hollowed part in the middle, and covered with plywood panels on both sides. These doors are usually factory-made, with standard sizes. They are great to provide access between rooms inside a building. Costs: Cheap flush doors may cost around USD270, including the installment. The more expensive types may cost around USD450. Door materials not only determine the look, but also durability. Here are several common doors based on their materials, complete with characteristics. Glass door provides light and visibility for people inside the building. It also has modern look, perfect for commercial buildings such as offices, restaurants, and shops. Glass door is visually customizable and can be adorned with paints or decals. Many modern houses use glass doors to provide natural light and warmth. Unfortunately, typical glass door is fragile, and easily damaged by vandalism. Building owners who want stronger glass door must pay extra. Glass door also requires regular cleaning, and it does not offer privacy. Steel door offers more durability than wooden or glass. It can be installed in private or commercial properties, and the resell value is relatively high. Steel door is also more secure. Steel door is not an ideal option for homeowners who are into remodeling, since it cannot be painted. It also absorbs heat and cold, and can rust over time. Since it is prefabricated, the style and size options are limited. PVC door is often compared to vinyl floor, since both are cheap, easy to clean, and can withstand several damage risks. This door can withstand termites and moisture. PVC door is also low-maintenance, since it only requires some wiping and dusting. Unfortunately, PVC door is relatively fragile, especially if you plan to change the lock/doorknob or install additional ornaments. Constant exposure to sun can also cause the material to weaken, which makes it impractical for exterior use. Fiberglass door offers better protection for temperature changes, especially for homeowners in areas with extreme weathers. This door is also easy to modify and paint, and it is relatively low-maintenance. Perfect for homeowners with small budgets. However, fiberglass door is not durable, so homeowners may need to replace it every few years. It is also easy to fold and break, making it less secure. The most versatile type of door, wooden doors come in various styles, colors, sizes, and decorations. People with woodworking skill can easily make wooden doors, even with plywood sheets, hinges, simple knobs, and locks. Wooden doors are widely available, from cheap prefab types to expensive, sophisticated solid panels. High-quality wooden doors last for many years, but the material needs constant care and maintenance. Homeowners may need to repaint the doors after several years. Chips and scratches can also be very visible. 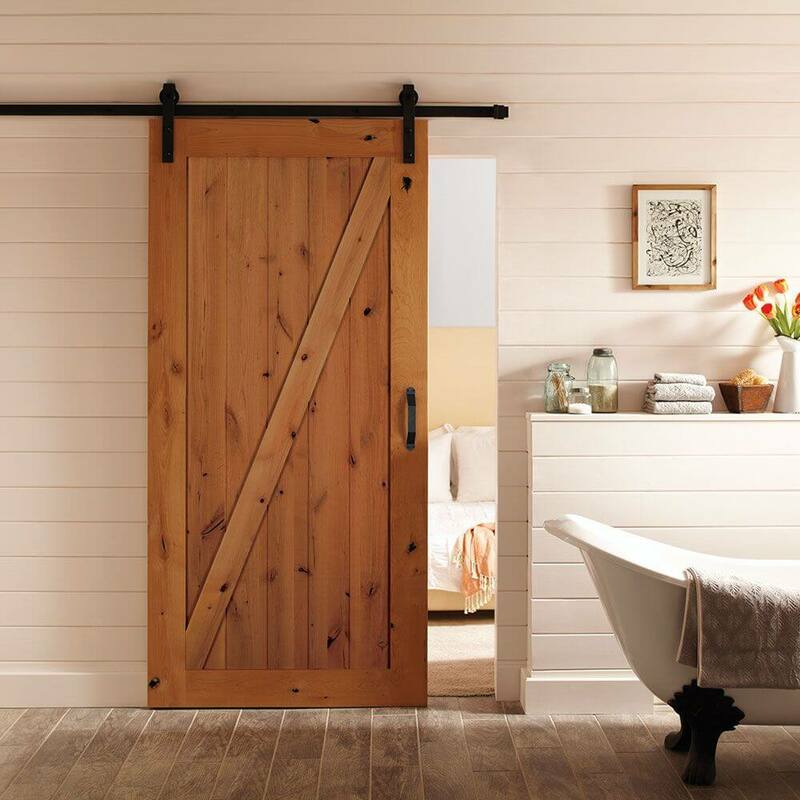 Interior doors should provide easy access from room to room, but still offer privacy (especially with bedroom or bathroom doors). Simple hinged doors usually do a good job, but depending on the building design, sliding doors may also serve as interior doors, especially if there is limited space. Swing doors have more specific purposes, which allow people to access rooms with minimum efforts. They are common at warehouses, any establishments that have kitchens, or as decorative elements in beauty salons and stores. High-speed door is a high-tech door with very specific purpose: to ensure quick and smooth access in industrial settings. This door can open fast and soundlessly, and made to withstand bumps, pressures, grazes, and other typical damages. This door is used in car manufacturing, food and beverage industry, chemical factory, hangar zones, and many more. Exterior door usually puts more emphasis on decorations, security, and durability. However, there are specific types of doors that are very common as exteriors. Rolling doors, collapsible doors, and revolving doors are common types of exterior doors that have specific functions. Many buildings have exterior doors that are basically the improved versions of hinged doors. Paneled doors, including their varieties such as louvred and French doors, are common at private properties. Large commercial or industrial buildings often have wicket doors, which are smaller doors that give access to people without opening the large, main doors. For example, in a warehouse that has wide doors for cars and trucks, wicket doors give convenient access for walking people without having to open and close the large doors. Doors are more than just simple access, but they can also serve as security measures, privacy protection, and decorations. Many types of doors can be modified for interior and exterior parts, and different materials and mechanisms determine their prices and functions. Make sure you study various types of doors and consider the pros and cons, before choosing the most suitable one for your need. After moving to our current home, we’ve been thinking of changing our doors particularly the main door. My husband wants a folded door, while my children like a sliding wooden door. Since you’ve stated here that it can save more space and easy to maintain, I guess the children won!